A trip to Yellowstone in mid September brought me up close and personal with the turning of the Aspen leaves to all shades of yellows and oranges. Their bright colors can’t help but make you feel sunny as they flicker in the breezes. Getting close, the masses of color aren’t the only theme as the spaces in between the sprigs take on more importance. I used this composition to teach a glazing process for creating colorful neutral backgrounds to my fall students at Bellevue College. I layered a thin flat glaze of Aureolin yellow, followed by thin glazes of Rose Madder, then Cobalt blue after each layer dried to create a luminous gray. This was too pale and flat alone for my interest, but made a foundation for adding more color wet on wet to blend and flow to enhance the neutral foundation. After 6-10 layers of color here’s what the background looked like before I even started painting the main attraction….the leaves. In the beginning I masked out the leaves so I could brush the background colors freely over the whole surface. 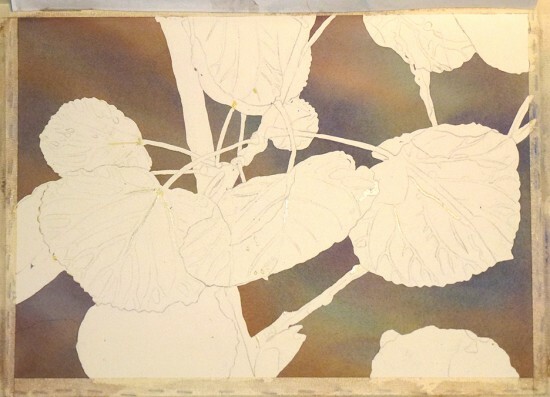 This image shows the mask removed, the veins sketched in and ready for color with additional masking fluid added to the lightest areas preserving the white of the paper. Still, when the leaves were painted, the background needed to have more blues and greens to tie in the green leaf in the lower right to make it feel like it belonged to the painting, so more layers were carefully added to unify the painting. What do you think? I think it works and I’ll add it to my watercolor gallery on https://sandyhaightfineart.com and enjoy the rest of the yellow Seattle autumn. It was a total joy to paint this close up of lilies that I saw in Vancouver’s Granville Island Market. The sensuous shapes, vibrant colors, and minimal texture were fun to build up with my glazing techniques making them richer with every layer. Dark color, such as the background and the deep wells of the flowers, are always difficult in watercolor because the paint dries many shades lighter than when applied. It can take 5-10 glazes to build up to the dark value that I envision. I wanted the background to be dark and neutral yet still glow with luminous color to compliment the oranges and reds in the flowers. 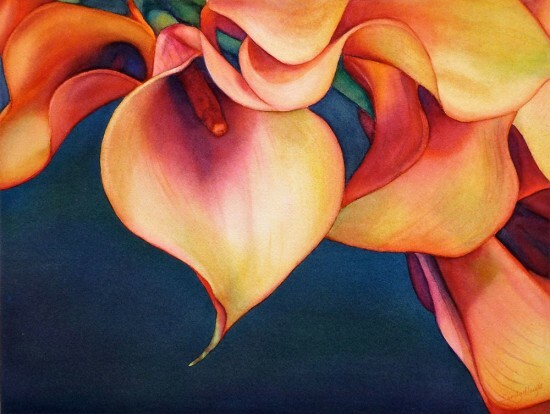 Certain colors lift and move around when re-wetted making it even more challenging to keep from streaking a large smooth area like the background or blending into a gradient area like the left two lilies. Flowers are a constant seduction for me. They can be beautiful, ephemeral and oh so fragrant in nature. It’s another pleasure to capture the colors and the mystical designs within them to enjoy as art, larger than life. 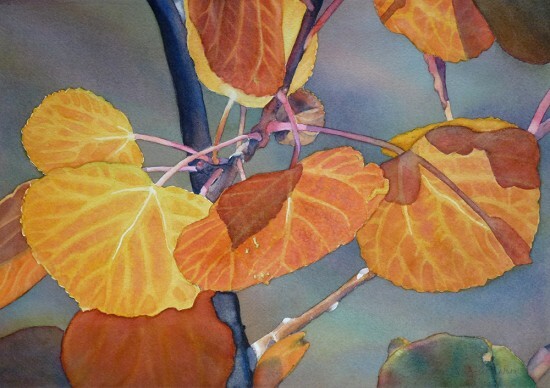 This painting was just added to my Watercolor Gallery on my fine art site at sandyhaightfineart.com. There are a few other flower paintings there and more to come! I decided it was time for me to record my painting process from reference photo to finish when one of my students, Rodney Hill, documented the different stages of completing his class watercolor painting. His printouts were of great value to future students explaining the steps they would use to paint realistically using photo references. 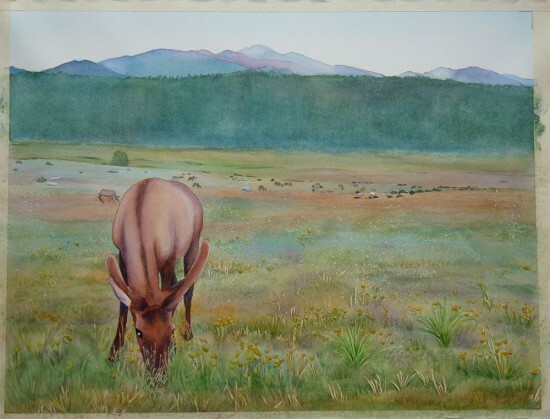 Watch how my watercolor painting of a young elk evolved. The reference photo is at the end of this post. 1. 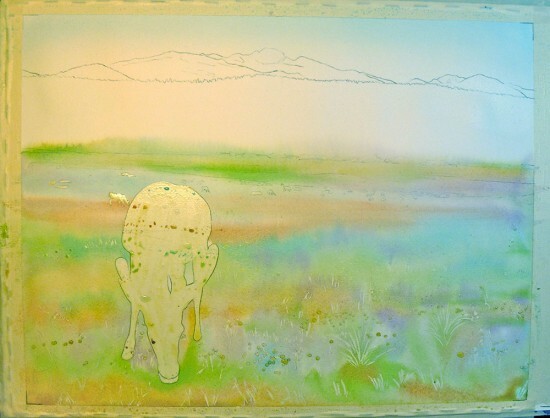 Once the paper is stretched by stapling soaked watercolor paper to gator board, dried, and outlines of the shapes transferred to the paper, a mask is applied to the foreground subject to preserve the white of the paper. 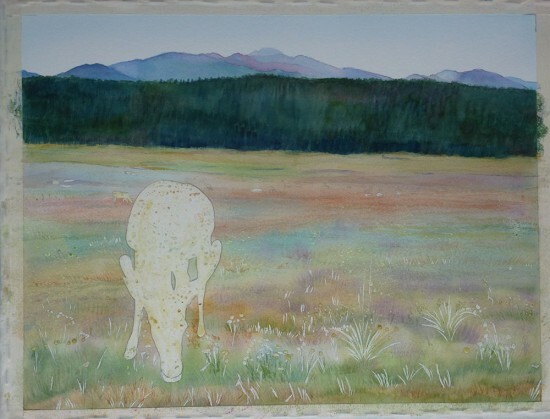 Some of the flowers and lighter grasses are also masked to allow a free and loose underpainting. The mask has a yellow tint in order to see where it has been applied. (This 1st photo is not lit correctly). 2. More background is added including the mountains and the dark forested hillside. More washes are layered onto the underpainting of the field. 3. Not being a landscape painter, I wasn’t sure how I was going to handle all the texture of the field but was eager to paint the subject. I procrastinated dealing with that dilemma and I removed the mask a bit early. Usually I build up the background to a near finished state before removing the mask. Now all the whites are available for adding in pure color or lighter tints. 4. 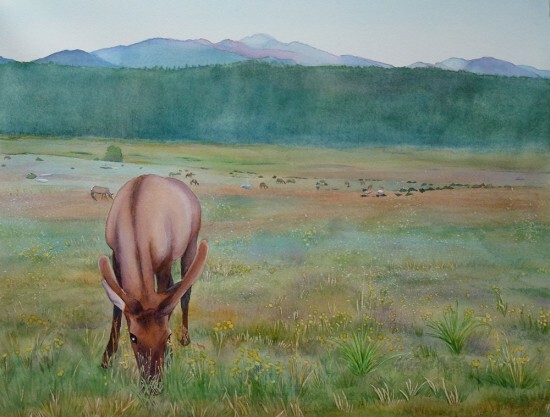 At this point, the elk is painted (my favorite part) and the background herd, rocks and bushes are added as well as more foreground layers of washes and textures to make all the masked grasses blend better into the field. 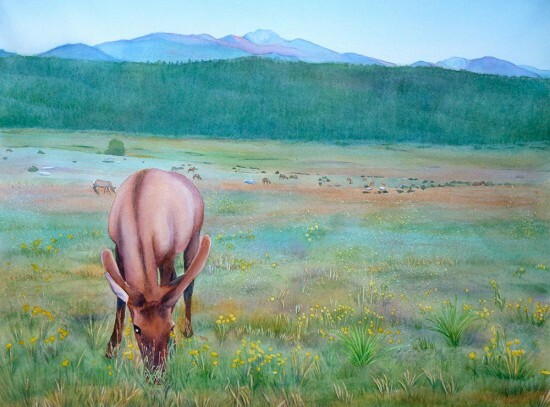 Now that the animal is developed, though, I realize that the dark background hillside is demanding way too much attention, distracting the viewer from the beauty of the elk by advancing with its strong values. Do you agree? I need to tone that down. 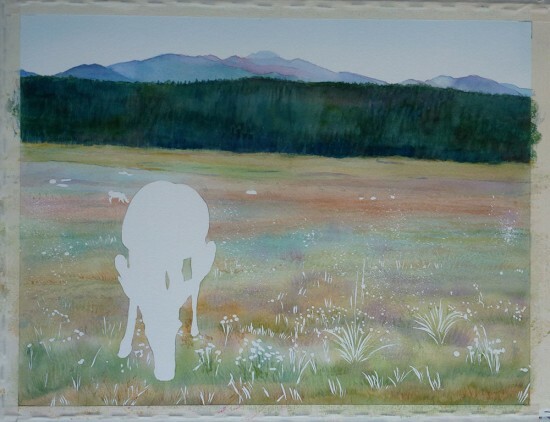 My other concern was that having applied mask to details in the field I was stuck with the task of defining the grasses and wildflowers more clearly than I might have liked. Since this started out as a demo painting, it worked well for teaching purposes by showing various ways of using and applying masking fluid. 5. Yes, it is possible to fix watercolor errors, to a point. I scrubbed away at that dark hillside to force it to take its proper, more subtle place in the back of the picture. I tried to straighten the horizon line a bit which was at an awkward downhill slant. This was as light as I could get it, and it still has some room to create a sense of the trees by adding more glazes of color. 6. I masked the yellow flowers again so that I could intensify the foreground with further washes and grass detail while preserving the color of the flowers. It’s hard to see the little blobs of mask over the flowers. 7. Here’s the finished painting again from top of the post, with trees suggested in the hillside, grasses more defined and yellows enhanced. Another layer of sky was added and more layers of washes in the mountains to finish it. 8. Below is the photo I used for reference. 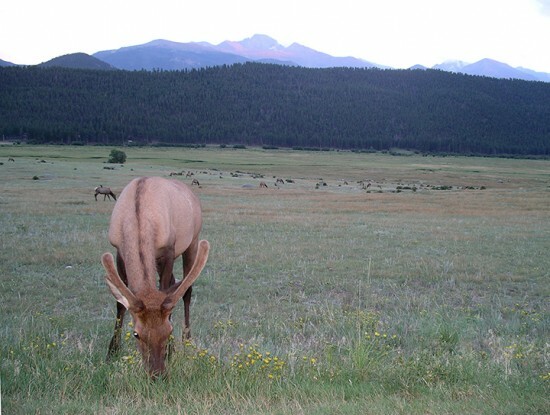 Driving out of Rocky Mountain National Park we passed this brave young elk, grazing right by the roadside. I’m not sure I’ll ever be a landscape painter…it’s hard to improve on Nature, but I loved painting this beautiful animal who let me get quite close for a photo. 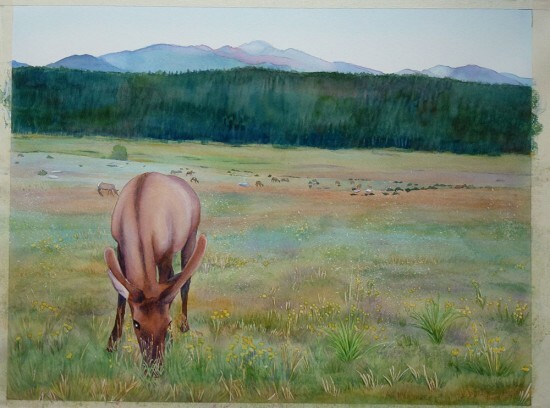 I just added a new painting to my fine art site in the watercolor gallery. 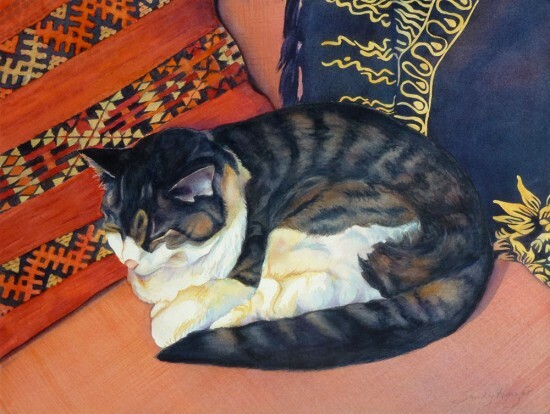 It’s a portrait of Ozzie, my cat for 15 years, whose grace and presence enhanced whatever space she chose to occupy. Ozzie The Cat is my first attempt at painting a furry creature in pure watercolor, and I found it extremely challenging to represent the texture yet softness of the fur and the complexity of the background patterns. With a subject for painting that is close to my heart the magic of bringing it to life in a new (and permanent) way is very gratifying. It goes beyond the representation of beauty in art to warming the spirit of love. As a watercolor instructor at Bellevue College I get to start a new half sheet painting every quarter in order to explain the process of developing a painting from a drawing or photo. I need to pick compositions that require some masking and texture to demonstrate, then, after that, its up to me to finish my paintings as my class time and attention is focused on coaching each student’s process. Teaching has spurred me back into painting realistically from photo references, which I did early in my own training as a watercolor painter before stylizing my art for a career in the illustration market. I’m trying varied subject matter that will help me coach my students through working on their own chosen images, which have included beloved pets. I’m starting to discover what subjects I enjoy spending lots of time with through painting. Some of my student’s work from recent classes is posted on this blog.